Day Trip to Our Happy Place: Kelly's! The Americano: The Perfect Summer Cocktail? Rhubarb: Drink It, Eat It, Wear It…It's All Good! Green garlic (above) is found in abundance at farmers' markets this time of year. Contributor Jim Dixon of Real Good Food shares a recipe that takes advantage of this fleeting spring pleasure. I often use the word "Pantesco" to describe the combination of Pantellerian capers and oregano with anchovy and garlic, and many of the island’s residents have potatoes in their gardens, so it's possible you could eat something like this salad on the rocky isle off Sicily. 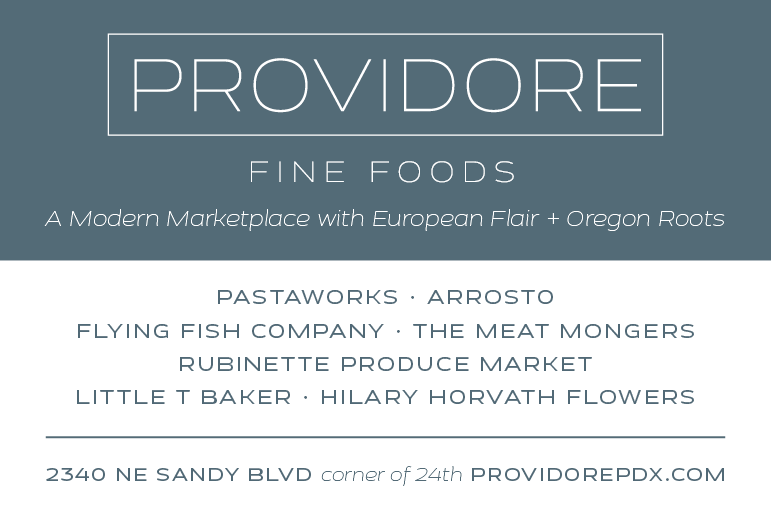 I got freshly dug potatoes from Groundwork Organics at the Portland Farmers Market, but any small spuds or fingerlings would be fine. 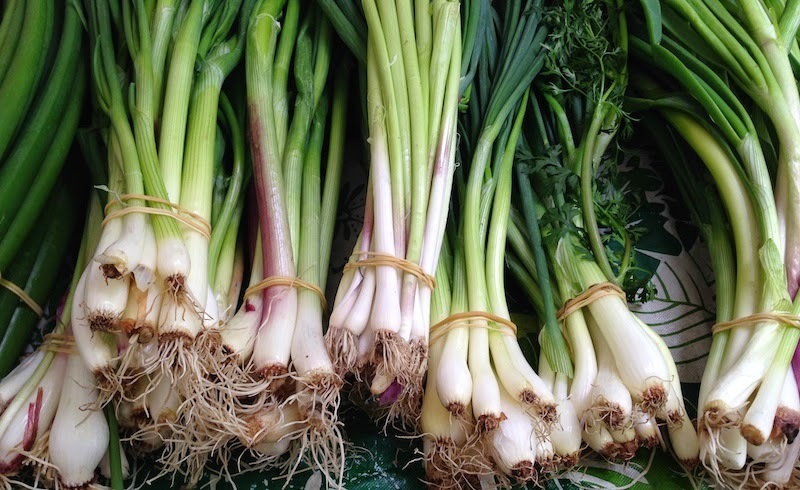 Green garlic, also called spring garlic, is the scallion phase of the plant’s life cycle; it looks like a small leek or big green onion, but with a distinctively garlic flavor and smell. I use the whole thing, white and green. Or substitute a clove of garlic and a couple of green onions. Pick small potatoes and cut any that are much bigger so they cook evenly. Boil in salted water until tender, about 15 minutes, then drain and cool. Peel if you want, but when cool slice the smaller potatoes in half as you add them to a large bowl. Toss with a few tablespoons of extra virgin olive oil and a splash of Katz Viognier Honey vinegar (or try an Asian rice vinegar, which is sweet) while they’re warm. Split the green garlic lengthwise, then slice crosswise thinly; add to the potatoes. 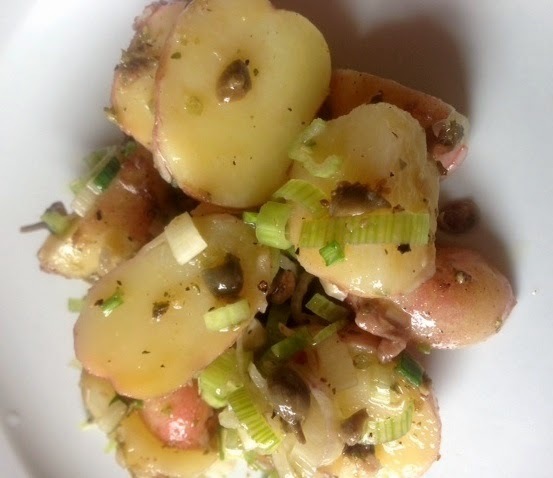 Rinse the salt from a couple of tablespoons of Pantellerian capers (or use regular capers), chop coarsely, and add. Toss in a diced anchovy or two; add a few good pinches of Pantellerian oregano (again, regular dried or fresh oregano is a good substitute). Grind in some black pepper and taste for salt. Best if allowed to sit for at least an hour; eat at room temperature. This was a fantastic salad - the kind of recipe I've shared. Super simple, but it really highlights the flavor of new spring potatoes, with lots of umami from the anchovies. This is a keeper! So glad you liked it…I a huge fan of potatoes, especially potato salads. Thanks, Jim Dixon!